Happy New Year! If this is your first week back to work for 2015, we hope that it is treating you well. Producing reports, following up, planning for the months ahead, January can be a busy month for many businesses. With our inbox’s overflowing, it can feel like an uphill battle organising yourself at the start of the New Year. It may seem obvious to some but there are few simple steps you can take to get on top of your workload and give yourself peace of mind. De-clutter – As they say ‘Tidy desk, tidy mind’. You will be surprised at how much paperwork you are holding onto that could easily be filed or binned. De-cluttering is an instant way to make you feel organised and ready to tackle your pending tasks. Create or re-organise your filing system – If you already have a filing system in place, check it is working for you and or do little spring cleaning. If you do not have a filing system, maybe it is time to create one. A filing system will save you time in the long run, when searching for that report from last year and will avoid any documents going walkabout. To do lists – A to do list is always the best place to start when organising your work day. It will not only help you get a better understanding of how many tasks to need to complete, you will also feel more relaxed. A daily to do list, written at the end of the day before will prepare you for the work day ahead and establish how much time you may have for any additional last minute tasks. Planning – Now that you have your to do list, you can begin planning. What is required to complete these tasks? How much time will it take you? Planning ahead may establish if there are any questions that need answering before you can begin tackling a task. Prioritize – Next it prioritization. In a dream world it would be great to tick off all the tasks on your to list list every day but as we all know, this is rarely possible. Although everyone may feel their request is a top priority, it is important assess which tasks really do come first. Scheduling – Having prioritized your tasks, you can now schedule when you aim to tackle them. Scheduling will hopefully help you put aside enough time to complete tasks and avoid that dreaded last minute rush. Reminders – Even with all these organisational measures in place, it is always possible for a task to slip your mind, we are only human after all. Any deadlines for tasks that you know cannot be missed are worth setting up reminder for, allowing you to relax and get on with your day. 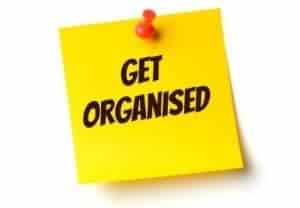 We hope these suggestions may help you organise yourself at this busy time of year and if you are already carrying out these organisational methods, we hope this gives you peace of mind that you are organising yourself to the best of your ability.